The Department of Art and Art History Digital Media area presents a screening of three films selected by Maaike Gouwenberg for the International Film Festival Rotterdam (IFFR). 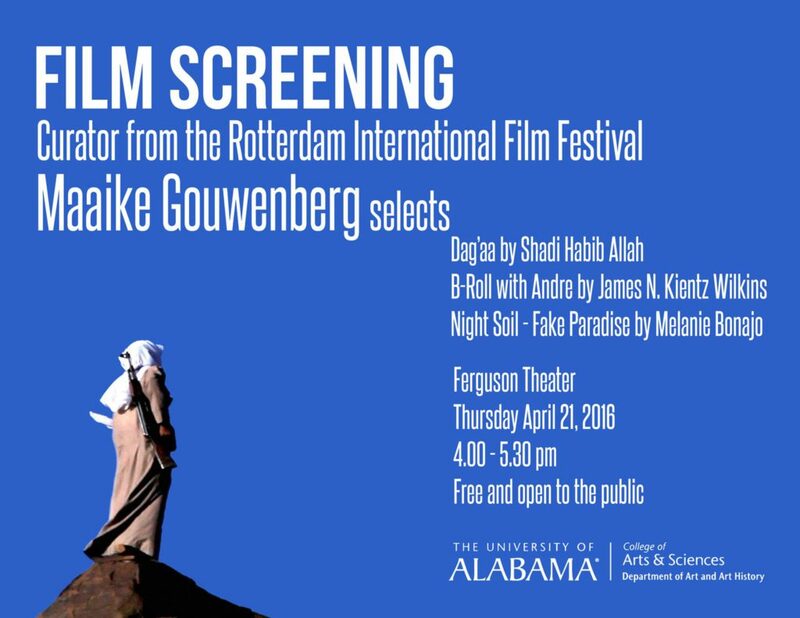 The short films will be shown Thursday, April 21, 2016 from 4:00-5:30 p.m. in the theater in Ferguson Student Center on UA campus. The public is invited to attend. Maaike Gouwenberg is a curator based in Rotterdam, Netherlands. In the last few years she was programmer advisor for IFFR Shorts and since 2015, part of the core team. In her curatorial work, she is interested in performative practice. The projects she has been involved in bring together theatrical and curatorial aspects, which results in performance programs and long-term collaborations with artists. In 2010, Gouwenberg initiated A.P.E. (art projects era) with artist Keren Cytter. Since 2014, Gouwenberg has co-directed her own multidisciplinary residency program, Deltaworkers, in New Orleans. She is a committee member at STROOM (The Hague) and Amsterdams Fonds voor de Kunst, and is a board member of the musical theater group Touki Delphine.